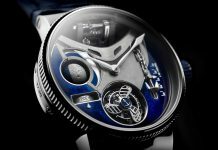 Ulysse Nardin do tend to freewheel from a design standpoint – gotta love the Freaks – but now they’ve done so mechanically with the Executive Tourbillon Free Wheel. It’s the watchmaker’s latest high complication and just as mental as you’d expect. Granted the case is a little less off-kilter than usual, but mechanically it’s something else entirely. It acts as a showcase for the different components of the movement in a far more aggressive way than mere skeletonisation. There’s plenty of the wonder material that is silicon on show throughout the movement, and the Executive quite literally pushes them in your face, raising them above the surface of the dial. That’s further enhanced by a box crystal that seems to make them float. It comes in white and rose gold, each using a different dial material. The former uses a white gold lattice, the rose a piece of slate. Both are lovely but really do just act as a background. Because of the elegance of the movement, the various components almost seem disconnected, like a mystery watch dialled up to 11. 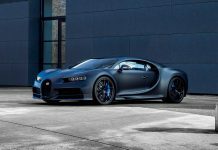 It’s more than mechanically pretty though; it has a seriously impressive seven day power reserve, meaning you don’t need to wind it for a week. You do need to wind the in-house movement yourself though. Well, you didn’t think you were getting that reserve with an automatic did you? There’s no actual complication other than the tourbillon, which is pretty much a prerequisite for haute horology nowadays. The way the movement’s presented is the complication. Of the two we’d have to plump for the rose version. That black and gold contrast highlights the stars of the show all the more, and the purple silicon escapement is far more conspicuous on it. It’s the kind of watch where nobody needs to ask where the 96,000 CHF price tag comes in – just over £76,000 in proper money. All they need to do is look. It’s as close to a piece of mechanical art as you’re likely to find outside of MB&F’s MAD Gallery. 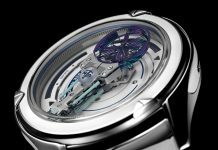 Share the post "Ulysse Nardin Let’s the Movement do the Talking in the Executive Tourbillon Free Wheel"